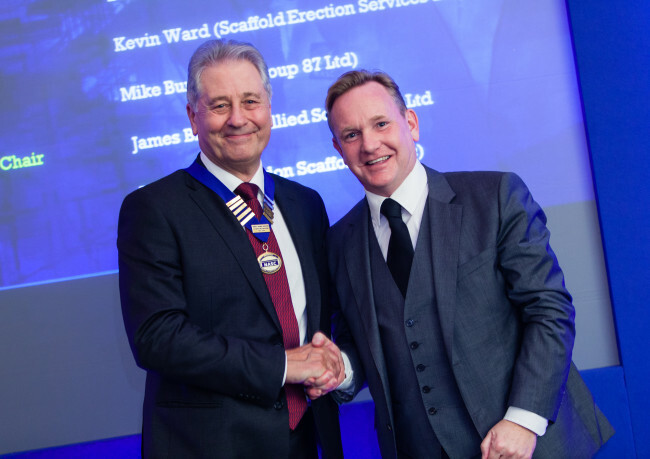 The outgoing NASC President, Kevin Ward’s ‘New Apprenticeship Challenge’ to create 400 scaffolding apprentices in his two year tenure has been surpassed – with 553 new apprentices created by NASC member companies. And the initiative has also raised £58,057 for Teenage Cancer Trust. This is great news for both the scaffolding industry and the TCT, and was announced at the confederation’s annual ball at the Queen’s Hotel in Leeds on Friday 27th November – two years on from the New Apprentices Challenge launch, following Mr Ward’s inauguration as President in November 2013. 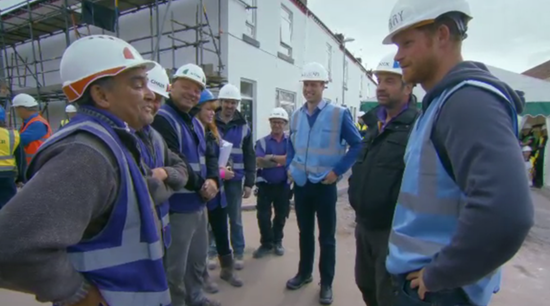 Mr Ward, who was once a scaffolding apprentice himself, said: “When I took on the role of NASC President, I challenged the members to achieve a couple fantastic goals during my two-year term – to create a minimum of 400 new CISRS apprenticeships and raise much needed funds for Teenage Cancer Trust. And I am very pleased to report that we have not only succeed in reaching the 400 target, but actually surpassed it, creating 553 new apprentices, and raised over £58,000 for TCT. 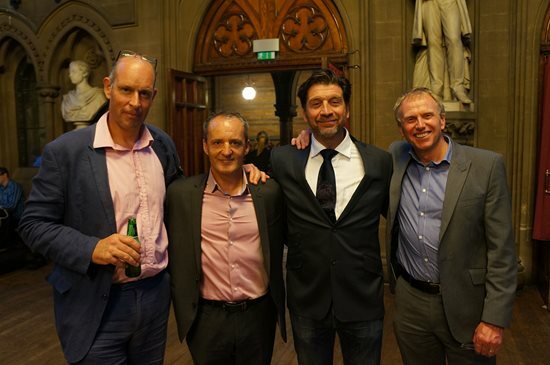 “I would like to thank all NASC member companies who took part in the challenge. 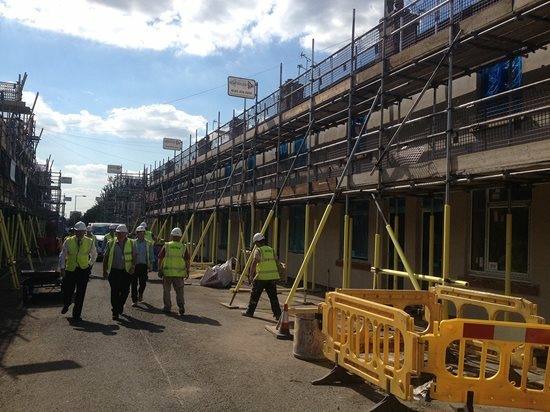 They have not only given these enthusiastic young people a great career opportunity in the scaffolding industry, but in the process have invested in the future of their businesses. And special mention must go to NASC member companies, Seabro, Interserve Industrial Services and Connect Scaffolding, who created 92 apprentices between them. 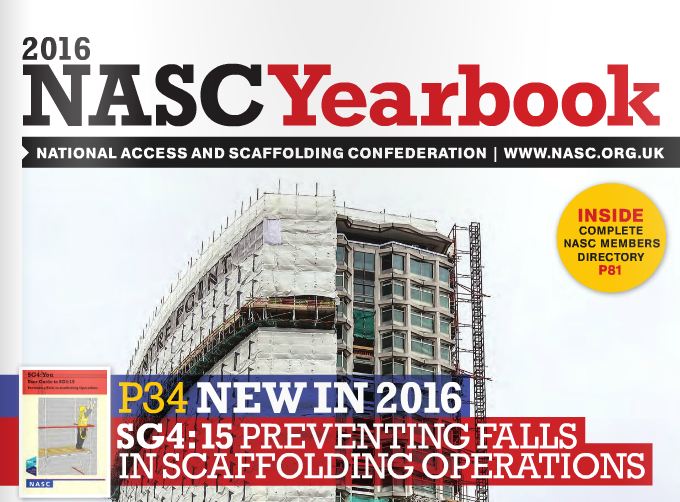 The NASC has launched the eagerly-awaited update of the confederation’s core scaffolding fall prevention guidance – SG4:15 – at its AGM in Leeds today (Friday November 27th). Fittingly in the confederation’s 70th anniversary year, the widely-recognised and industry standard for safe scaffolding, SG4:15 – re-titled ‘Preventing Falls in Scaffolding Operations’ – was launched in front of the NASC’s membership, with the document available free to download from the NASC website. Hard copies of the management guidance and SG4:You pocket user guide will follow in due course. In addition, NASC MD, Robin James also revealed that the updated guidance will be showcased at NASC ’roadshow’ events in 2016. Whilst many of the principles of SG4 remain unchanged, the fine-tuning “evolution not revolution” updates to the guidance reflect the broader scope introduced by TG20 compliant scaffolds, changes to good practice and industry innovation in the scaffolding sector. 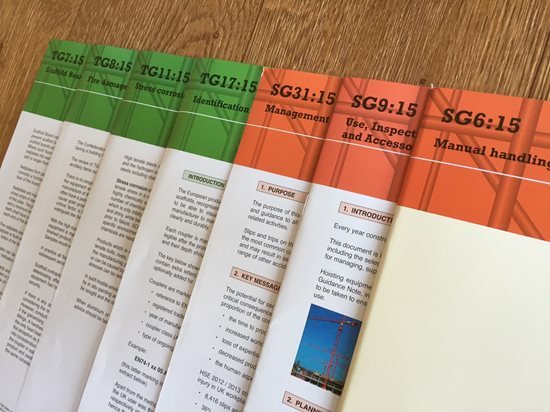 As with previous versions of SG4, the latest SG4:15 update will come in the form of a detailed A4 management guide, ‘Preventing Falls in Scaffolding Operations’ and will be supported by an A5 pocket user guide, SG4:You – providing essential information to scaffolders in a user friendly format. And speaking at the AGM, Mr James said: “We’re very happy to be launching the revised SG4 guidance. Since its inception in the 1990s, SG4 has stood the test of time and evolved to become the de facto standard for the protection of scaffolders working at height. 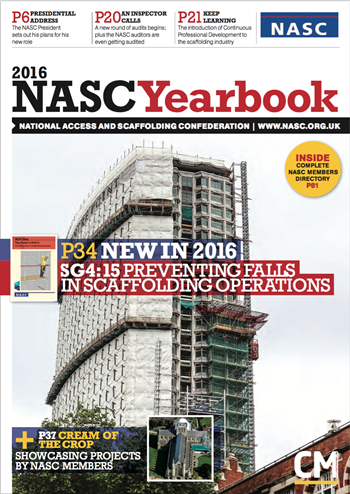 “This core NASC publication – backed by BuildUK and principal contractors across the UK and beyond, internationally – continues to focus on prevention and protection, like the ‘Scaffolders’ Safe Zone’, but now also includes a range of updates to reflect changes within the industry, such as the introduction of TG20:13. 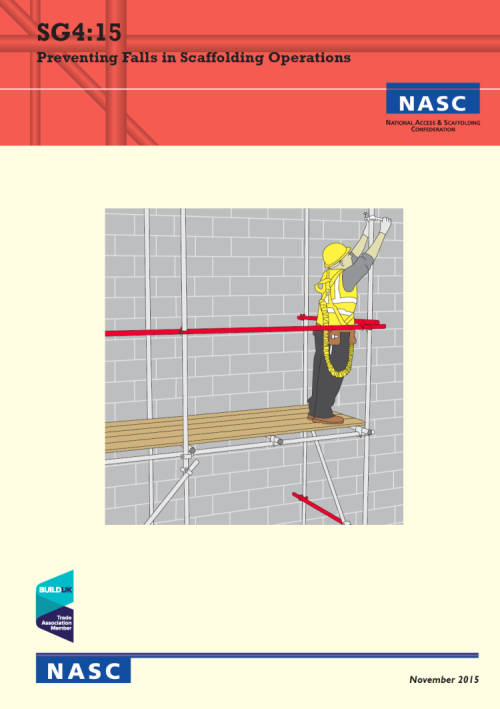 For details about the latest SG4:15 ‘Preventing Falls in Scaffolding Operations’ Safety Guidance, the TG20:13 full suite and the NASC – the UK scaffolding industry trade body – including becoming an NASC member, please visit www.nasc.org.uk or email: enquiries@nasc.org.uk. 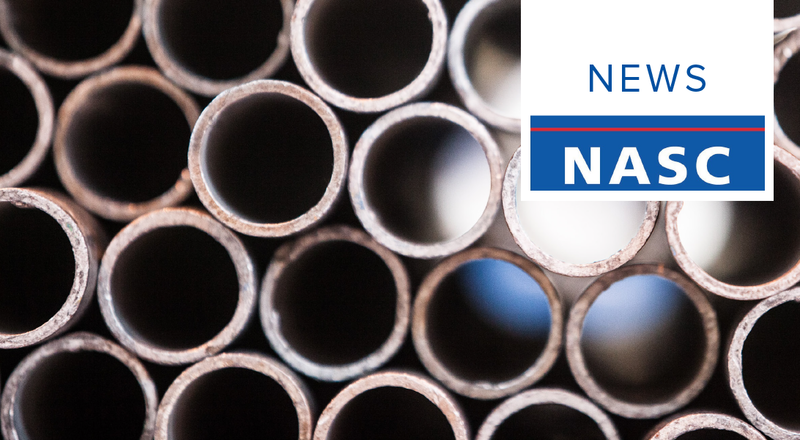 The NASC held its AGM at the Queen’s Hotel in Leeds today (November 27th) – releasing a range of news from the UK scaffolding industry trade body. The packed agenda – reflecting the high activity levels of the confederation and its membership – included speeches from in-coming President, Alan Lilley (Commercial Scaffolding Ltd), Training Director & CISRS Manager, Dave Mosley and NASC MD, Robin James, to a full audience of NASC contracting, hire and sales and information members. 2. The election of a new NASC President, Alan Lilley. And a new vice-President, Des Moore, of TRAD Group Ltd.
3. 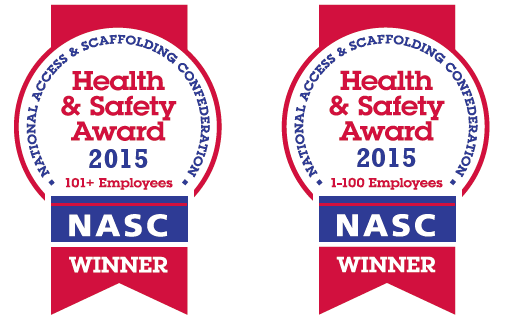 NASC Health and Safety biennial award winners: Interserve Industrial Services (100+ employees) – ‘Highly Commended’ runners-up Wood Group Industrial Services Ltd – and Denholm Industrial Services (sub-100 employees) – Connect Scaffolding Ltd ‘Highly Commended’ runners-up. 4. 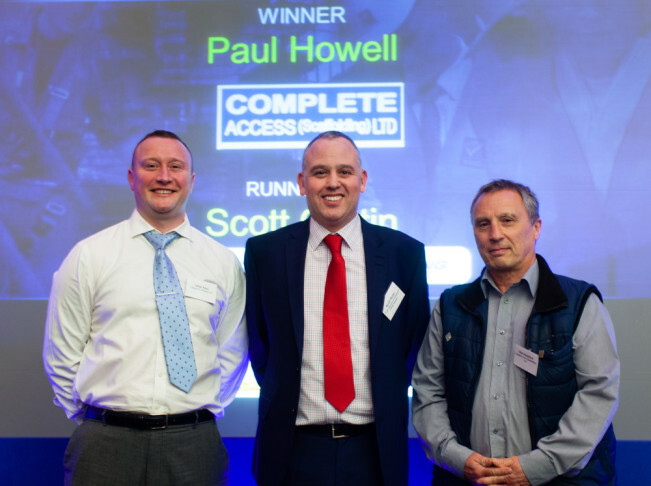 2015 NASC Apprentice of the Year award winner: Paul Howell of Complete Access, and runner-up Scott Curtin of Connect Scaffolding. 5. The imminent launch of a bold new, user-friendly NASC website – with a revised ‘Find a Member’ service, upgraded and easy-to-navigate Online Shop, prominent social media and more. NASC MD Robin James said: “With TG20:13 a force for good in the industry, the launch of our core guidance, SG4:15, 553 apprentices created and £58,000+ raised for Teenage Cancer Trust by outgoing President, Kevin Ward – not to mention such positive activity for the confederation and our 260+ members – it’s clear the scaffolding and access industry is booming. And NASC is at the heart of the industry activity. 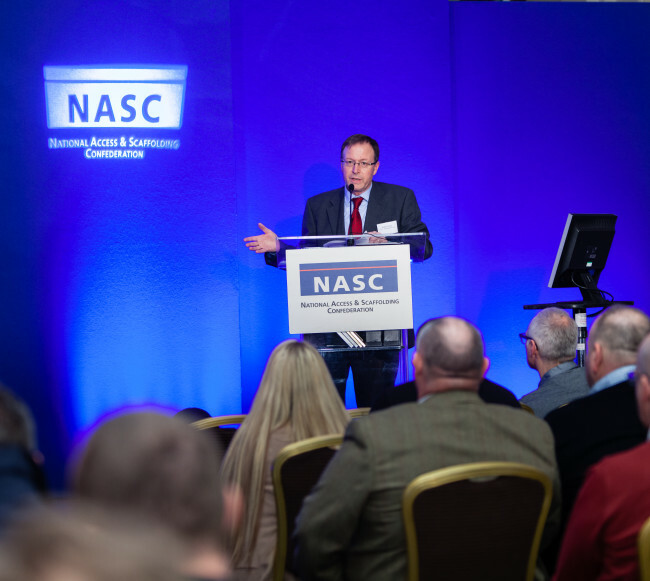 “As ever, the NASC has been helping to set the industry agenda. And we are confident our new president, Alan Lilley, will play a key role in that – especially with his aims of increasing the membership and helping small and medium sized firms to get on board. In-coming President, Alan Lilley said: “It is with a sense of pride that I take on the role of President of the confederation for the next two years. I am pleased that the NASC has never been in a stronger position than it is at this time: Membership is at an all time high, our technical and safety guidance is widely published and adopted, the messages we put out are being heard and I now believe the NASC is the premier trade body in the UK. The NASC has released a raft of seven revised and updated Technical Guidance (TG) and Safety Guidance (SG). These revisions have come as part of the NASC’s on-going commitment to refresh published technical and safety guidance on a five year cycle. NASC members have received copies of seven guidance notes in the post during November 2015 (marked for the attention of the Managing Director) and these will also be available to full members via download, free of charge, from the members area of the NASC website. SG6:15 – Manual Handling in the Scaffolding Industry: A well-established document that remains robust and valid (date changes only). SG9:15 – Use, Inspection & Maintenance of Lifting Equipment and Accessories for Lifting in Scaffolding: A complete review with new visuals. SG31:15 – Management of Slips and Trips: Significant changes including added images. TG7:15 – Scaffold Board Nailplates: Date changes only. TG8:15 – Fire Damage: Cost of fire damage evaluation does not warrant recovery of metal components. TG11:15 – Stress Corrosion Cracking in High Tensile and Alloy Steels: Minor amendments only including change of date. TG17:15 – Identification of EN74-1 Couplers: Date changes only. The technical guidance notes are comprised of short 1-2 page update sheets, whilst the safety guidance notes are longer, made up of six to 48-page documents respectively. NASC MD, Robin James said: “With a wide range – from a short TG8 update on fire damage, to a much larger SG6 revision on manual handling in the scaffolding industry – these seven revised technical and safety guidance notes will be useful updates for the NASC membership and wider industry.